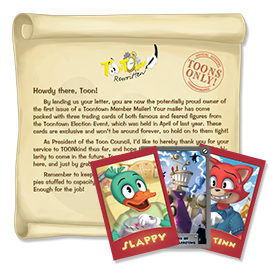 Toontown Member Mailers are FREE real world, "out-of-Tooniverse" packets straight from the Toon Council with Trading Cards and other merchandise packed in them. We'll send them to you for free to anywhere in the world - all that we ask is that you just send us an envelope! When sending in your envelope, feel free to stuff it with your own letter or fanart. We can't reply to everyone, but rest assured it will make its way to the Toon Council! Your artwork may even end up featured on the Toontown website. Always ask a parent before participating! Three Toontown Trading Cards: Wedding Cake, C.E.O., An Old Boot (Series 4-10, 4-11, 4-12), plus a a mini Toontown Poster! These items were also available at ToonFest at ReplayFX 2018. 1. Obtain two envelopes, and two stamps. You'll need one of these for sending, and one of these for us to send you a mailer back! Any size envelopes will do, but to avoid creases in the artwork, we recommend your first envelope be at least 8.5 by 5.5 inches. 2. Address the first envelope to yourself. Don't seal the envelope! We use this one to send back your Toontown Member Mailer. 3. Address the second envelope to our mailer program location. Before moving on, make sure both envelopes have stamps on them! Postmaster Pete can't process any envelopes without stamps. 4. Take the first envelope and stuff it into your second one. 5. Seal the second envelope, and stick it in the mail! We send out hundreds of Member Mailers per week, so it may take around 4 to 6 weeks for you to receive your mailer. 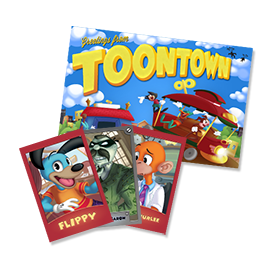 Once it arrives, open the envelope carefully and enjoy your FREE Toontown Member Mailer! These Member Mailers have been retired, but if you missed out - don't worry! We're always working on new content to send out. Keep your eye on the Toontown Blog to make sure you never miss out on the newest Member Mailers. Mailers will be fulfilled while supplies last, and only guaranteed if your outer envelope was postmarked on or before March 31st, 2019. Only one inner envelope may be enclosed within each outer envelope, but multiple envelopes from a single household are allowed and encouraged. Toontown Rewritten reserves the right to limit quantities fulfilled to each household. Due to limited supply, we're unable to fulfill requests for any mailers listed in the "Past Mailers" section above. 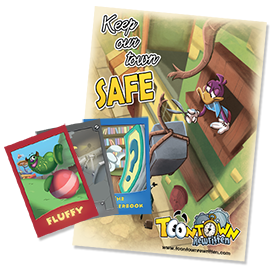 Keep your eye on the Toontown Blog so that you don't miss out on new Member Mailers! International fulfillment is possible, but requires a few more steps. United States Postage must be affixed to the envelope addressed to yourself, but US Postage can typically only be bought in the United States. One option is to enclose an International Reply Coupon instead of postage on the inner envelope. However, these coupons are not available in all countries. If you need help or have any questions about Toontown Member Mailers, feel free to contact Toontown Rewritten Support.